Back Porch Bakery is as good as it gets! 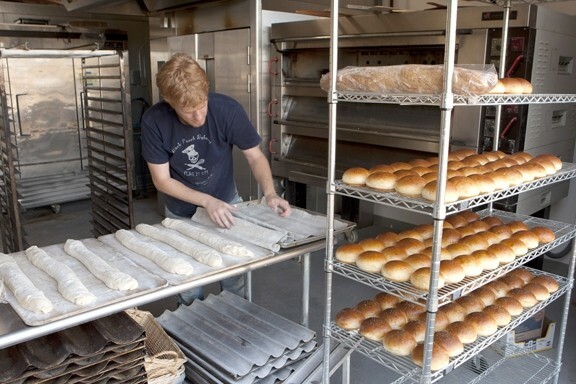 FERMENTED EDIBLES: Back Porch Bakery started out selling products literally on a porch, but now co-owner Dan Berkeland (prepping baguettes for the oven) makes many different types of bread for a variety of restaurants around the county. Everybody has a dream, but people always find all of the excuses they need to keep them from getting started,” said chef Dan Berkeland, founder and co-owner of Back Porch Bakery in SLO. 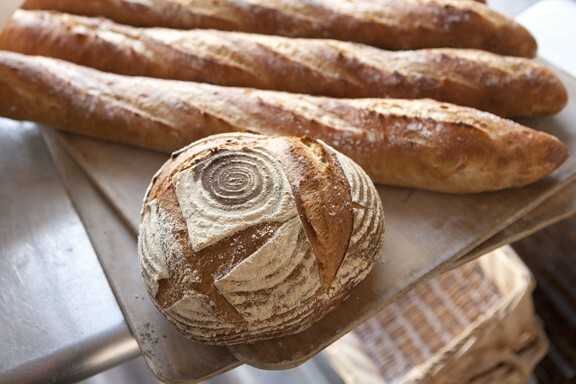 He and his partner Bill Brocco own and operate a wholesale bread and pastry company that supplies many of South County’s best restaurants with artisan breads, brioche hamburger buns, crisp croissants, and decadent, fruit-filled pastries. Although you can’t buy their delicious goods at the bakery yet, they plan to open a retail shop in the not-too-distant future. But you can easily find their artisan baked goods at restaurants and stores in SLO and the Five Cities area (more on that to come). He began shooting photos of his friends with their freshly baked loaves and posting them on Facebook, which led to making many more new friends. One of those new friends was Avila Beach entrepreneur Michael Kidd, who wanted to buy bread and pastries for his La Fonda Hotel and Joe Momma’s Coffee. The queue of customers kept growing, so Berkeland’s next step was providing a bright blue and red flag on his porch and Facebook page. If the flag was up, it was worth parking to go inside and buy a loaf or several. He quickly outgrew his home kitchen, but soon found a suitable business location in SLO and a new partner who loved baking. Bill Brocco had recently relocated to SLO from Pittsburg with his wife and children. The same age as Berkeland—both are 41—Brocco had tired of the big-city lifestyle. Brocco asked Berkeland for a recipe to make bread, and a great partnership began. The duo admitted to me that they constantly argue about life and baking concepts, but they were exhibiting their best behavior while I visited. I first met Berkeland when he was the chef at Sustenance (now defunct) in SLO. I was impressed by his passion for cooking, and the fact that he had lived in Switzerland and Italy where he learned to cook professionally. Throughout his professional cooking career, he’s continued his work in the world of art. Berkeland and Brocco have done quite well considering the impressive line of customers for whom they provide their various breads, pizza dough, and pastries. While you can’t purchase bread at the bakery yet, you can enjoy their decadent chocolate or almond croissants, freshly baked baguettes, and/or pastries at this growing list of great SLO County businesses: Bello Mondo Café, Coastal Peaks Coffee, Joe Momma’s Coffee, La Fonda Hotel, Linnaea’s Café, Lincoln Market, Luna Red, Novo, Nucci’s Pizza, Ocean Grill, Robin’s, Sal Paradise, Sidecar, Vintage 1255, and Two Cooks Catering. I love discovering artisans like Berkeland and Brocco and writing about them so others can find their great products, too. 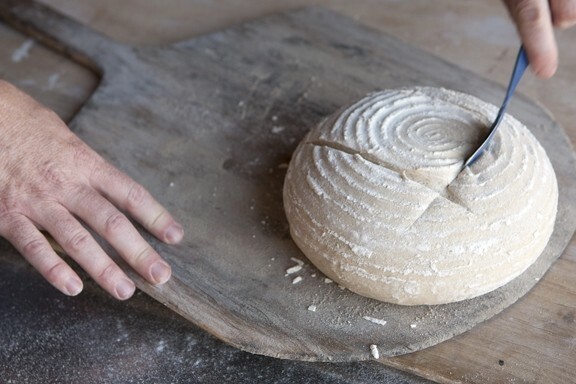 At first I thought this story was about the Back Porch Bakery and their great breads and pastries; perhaps I’d add some recipes. But as I wrote the story, it occurred to me that that wasn’t the point at all. It’s about people who are so consumed by their passion they dared to make it a business, and it was successful far beyond their wildest dreams. Think about it—Facebook helped make that happen. My story is similar: When my husband Dan and I relocated to SLO County nearly 18 years ago, I began my longtime dream of writing a column about food and wine, thanks to New Times founder and my mentor, Steve Moss. So now I ask my readers—what’s your dream and what are you doing to make it come true?